This raid expedition begins with Yioan in Beasts' Domain. This is an Alaran found at -620, 2755, 10 (due south of Kalda and Mea Treg who are in the zone's northwestern corner). - Completed "Fun with Fungus"
- Completed "What a Mess"
- Completed "Searching for a Cure"
You have entered Evantil: Heart of the Oak. - To trigger the event, someone needs to run into the tree. - At the top of the ramp, use fire nukes and ranged/melee attacks to DPS the Molar and Impacted Molar to their deaths. --- The Molars do not summon and are permanently rooted. - Every 1-2 minutes, four trash mobs spawn at the bottom of the ramp and auto-aggro anyone in the zone. --- These can be killed by regular DPS. --- Each individual trash mob can be run over one of the two campfires, and then DPS'd to 60% at which point they will run up to the Molars and explode, damaging the two Molars; however, you may find this more trouble than it's worth. - After the two Molars and all trash mobs are dead, you can enter the tree (you can take a break and med up at this point). - Clear your way up the ramps, being careful not to aggro the Nest Protector in its room. - Once ready, engage the Nest Protector. --- The Nest Protector and all adds are leashed to the room. If you pull them outside the room, they reset at 100% health. --- Nest Protector has an AE knockback. --- An aura circles the room, inflicting anyone who steps into it with a DOT countdown to a knockback + nuke. --- The Nest Protector spawns timed adds (3x "an aggressive ant") every 30-45 seconds. ------ There is a maximum number of adds that can be up at one time. These are stunnable and mezzable. --- Sporali mobs also appear here, but it is unclear what they do (also mezzable). --- Several mantraps surround the room. These will summon random players to their locations, silencing them. To free a player in a mantrap, the mantrap must be killed. ------ These respawn instantly, but the player is freed upon the death of a mantrap. - Kill the Nest Protector and all aggressive ants to win the event. The tree seems to come to life with a great exhalation. Embers spring to life in old campfires as leaves swirl around your feet. At the top of the ramp leading into the tree are two treants: "Molar" and "Impacted Molar". You need to kill the two treants while also killing the adds that spawn. The Molars each hit for a max ~27,000; rampage; are permanently rooted; do not summon; and are only susceptible to melee damage and fire-based nukes/DOTs. A great gust of moldy wind flings you from the heights. You can melee the Molars without being kicked away, but have to stay in front of them. As long as the Molars are alive, adds will be spawning and auto-aggro'ing your raid (these adds have cross-zone aggro and will seek you out wherever you may be). You'll get four adds every 60-90 seconds. Adds hit for a max ~25,000. The magical healing regenerating you protects you from the heat of the fire. a tanglefoot flower panics and flees from the flames engulfing it. Once the Molars and all adds are dead, you can move up into the tree. Impacted Molar has been slain by _____! Molar has been slain by _____! The unnerving breathing from the great tree stops. Things become eerily quiet. As there is no timer to engage the second half of the event, you can use this time to med up to full and rebuff, if you need. Clear your way up the ramps (ants in the path are tame mobs - hit for a max ~11,000, are mezzable/stunnable). Be careful not to aggro the Nest Protector until you're ready to engage. If aggro'd, it will summon players into the room, and if left idle after being aggro'd, the event does a full reset. 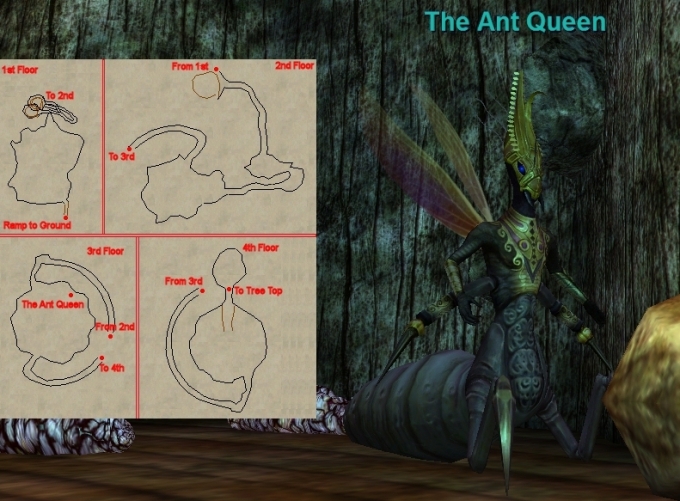 The main encounter here, "Nest Protector" spawns on the second floor of the tree (see this image for The Ant Queen -- the Nest Protector is found in the larger of the two rooms on the tree's second floor). It spawns adds: 3x "an aggressive ant" at a time about every 20-30 seconds up to a maximum of 18(?). These adds are mezzable and stunnable, and hit for a max ~12,500. If you have more than a certain number of ants alive at a time, they begin casting "Life Harvest" on targets and healing the Nest Protector ("Life Harvest" acts as a lifetap). Too many ants have left the nest. Some begin to return, wanting to take a prize with them. an aggressive ant latches onto its target and, by expending its own life force, drains some of its victim's life and gives it to it's host and nest. Seen By Target: An ant latches onto you and drains your life, empowering the nest. One of the spore sprouts pulls free of its roots, raises its arms and moves toward _____. Around the room are numerous mantraps. These will target random players and pull them to their location, inflicting them with "Flowery Grasp" (holds them in position and an indefinite silence). In order to free the player, that particular mantrap needs to be killed (mantraps have relatively few hitpoints and can be managed by a single DPS group). Note that these instantly respawn. The molars blocking the entrance to the great tree grow strong as they stand idle. A creaking sounds preceeds a great, warm wind. All of your efforts are swept away and things return to normal within the great oak. If the Nest Protector is left idle for more than about 30 seconds, the raid does a full reset (Molars respawn). Kill the Nest Protector and all aggressive ants to complete the raid. Nest Protector has been slain by _____! NOTE: In addition to chest loot, everyone in the zone receives 10x "Crystallized Fear" (used as an alternative way obtain raid drops, from Ilana Sunmire in the Harbinger camp of Shard's Landing. Add Heartguard to loot table please. Only 1 weapon this go.